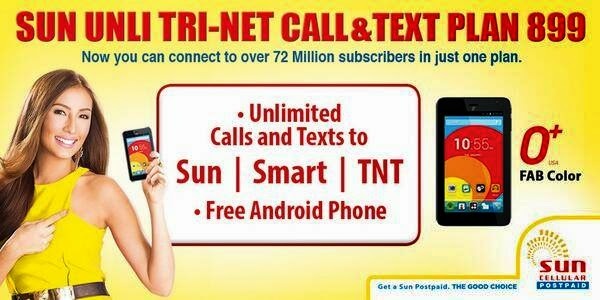 Here’s a good deal to Sun Cellular subscribers, when you apply for unli tri-net call and text plan 899 you’ll get a free Android tablet with phone functionality. O+ Fab Color is exclusively available to Sun Postpaid subscribers, it run on Android Jellybean OS and powered by a Dual core processor. While you’re on gaming mode you with this tab, you can also receive text and calls from any our your friends from Smart, Sun and TNT. You can never miss any of their messages as Plan 899 gives you unlimited TRINET texts. With this free phablet, you can also enjoy fast internet connection offered by Sun Cellular nationwide coverage. All you have to do is to try this Add on plans that gives you hourly rates on internet browsing, just register using your postpaid phone. This is for individual postpaid subscriber, if you want a group plan go try Sun Postpaid Group Plan . It gives you 3 smartphones and unli call and texts for only 999 pesos monthly service charge. For more details about Sun Plan 899, you can visit their Facebook page and Twitter account.